I got an email today from one of my all-time favorite organizations, Sightline Institute, that just blew me away. This is one of the best tellings of an organziation’s history that I’ve seen in a long time. It’s succinct, personal, filled with rich, specific imagery (especially for an organization that mainly trades in data and policy!) and best of all, it places the reader into the story. Sightline has a long history of top-notch writing, so it’s no surprise to seem them hit it out of the park. Any organization looking to tell its story better could learn a ton from studying this single email closely. Twenty years ago, I lugged a refurbished library table into my cramped bedroom closet, drilled a phone line through the wall, and let myself begin to heed the mission that had been calling me: to make the Pacific Northwest a global model of sustainability. Daunted but unswayed by the audacity of this goal, I began to do what I have been doing ever since: describing the challenge to others. And then as now, they—you—joined me. You brought your talent, grit, generosity, and faith, and the result was Sightline Institute, then called Northwest Environment Watch. Sightline grew through eighteen books, scores of reports, hundreds of speeches, and thousands of articles and blog posts. It grew from hundreds to thousands to tens of thousands of monthly readers, each a force for change in his or her own community. It grew to reach media audiences tallied in the tens of millions and to shape the thoughts of governors, senators, and CEOs. In time, it grew influential enough to leave fingerprints on Cascadia’s future. In our first decade, we launched Stuff, studied in hundreds of classrooms and in tens of thousands of copies. We planted the seeds for a carbon tax-shift in British Columbia. We coined the term “green-collar jobs,” words that would eventually issue from the lips of presidents. In our second decade, we inspired bold commitments to compact urban growth in key Cascadian cities. We prompted new rules on toxic flame retardants by studying chemicals in breast milk. We played midwife to pay-by-the-mile car insurance and peer-to-peer car-sharing. We designed regional carbon-pricing policies and brought them close to adoption. We unmasked the dangers of Big Coal’s export plans, revealed the folly of urban highway expansion, and championed a new, green approach to managing the rainwater that falls on our communities. Sightline’s fingerprints, your fingerprints, are on all these things and more—much more. Now, today, pausing for a quiet moment in Sightline’s Seattle offices—brimming as usual with passionate and intelligent people—I stand in awe of these accomplishments. They have been improbable, considering that Sightline’s annual budget makes us account for just two one-millionths of the regional economy. In the animal kingdom, we would be like a gnat trying to steer an elephant. Yet I am filled with hope for the years ahead. The challenge is no less daunting than ever, but we have grown, in concert with you—our friends, supporters, and allies—into a force to reckon with. Sightline’s influence has never been a function of our mass. It is a function of the light you help us spread. Comets such as Halley’s are less than one ten-billionth the mass of the Earth, yet they’ve been known to change the course of history. Sightline’s strategy is comet-like: a small nucleus of staff and board plus a long tail of supporters and allies. Shining outward from this body, our ideas, presented well, can attract the attention of millions and even define a new direction. A Cascadia worthy of our grandchildren and theirs is more attainable than ever before. But it is certainly not inevitable. It’s a possibility only—a possibility whose realization depends entirely on what we in this generation choose to do. In the span of 240 months, Sightline, now giant compared with my bedroom closet but still minuscule compared with the region we aim to influence, has begun to shift the public agenda in a region of 17 million people. It’s only a beginning, but, I hope you agree, it’s a promising one. Just think what we can do together in another 20 years! In the next two decades, together, we will shine even brighter. We can put a price on carbon. Indeed, we can move the region along the path that leads beyond carbon and dirty fuels entirely, to clean energy. We can make prices tell the ecological truth in other ways, too: from pollution to traffic congestion to habitat destruction, we can better align the power of markets with the conservation of our natural inheritance—of Creation. We can measure what matters, replacing GDP with better indicators of progress. Through better reproductive health technologies and policies, we can help create a Cascadia in which every child is born wanted; we can help men and women have the families they want, when they want them, even as we temper population growth. We can build complete, compact, walkable communities—places where motorized travel is less common because less necessary. All these things and more we can do. Twenty years ago, I was the one at the library table in the closet signing the papers to incorporate Sightline, but the resulting improbable cavalcade of hope has never been about me. It’s been about you: Your love for this place on Earth. Your confidence that we can do better, that we can build an economy and way of life that can last. Your faith that we, here, can set an example for the world. For your love, confidence, and faith, I thank you. Here’s to the next 20! My wife Molly works for a big-time international multidisciplinary buildings engineering firm. Over the dinner table, I’ve learned a bit about how big buildings get designed and built. Another frequent topic of dinner conversation in my house is the myriad challenges of designing and running truly effective environmental advocacy campaigns. The other day, I had one of those “aha!” moments. Buildings are really complicated. They can’t be designed and built by just one person, or by a team of people with only one set of skills. For example, on Molly’s current project, there’s a mechanical engineering team (they figure out the heating and air conditioning), an electrical engineering team (the do the lighting and electricity), and a structural engineering team (they make sure the building doesn’t fall down). And that’s just the engineers! There are also multiple teams on the construction side, the data center designers, and more. Playing the role of designer & project manager are of course the architects. Each of these disciplines sees the world very differently. Each of them have different expertise, and each brings important knowledge and skills to the project. Failure to incorporate any of these disciplines’ perspective would almost certainly lead to a failed project — a building that is too hot or too cold, doesn’t have reliable power, falls down, is ugly, doesn’t have the functions the owner needs, or goes wildly over cost. As you might expect, these different teams often have wants and needs that conflict with the other teams. The most beautiful building design might be impossible to cost-effectively heat or cool. Electrical and mechanical teams can tussle over limited space in the service spaces. Structural wants bigger, heavier beams while the project owner wants to keep cost down. All of these differences of opinion have to be worked out, typically through ongoing “coordination” meetings. In the best cases, potential conflicts are identified early in the process, before too much time and energy has been spent. But since building design is always an iterative process, coordination is a continuous process, and as the building design evolves, it can become more and more stressful and high-stakes. Let’s talk about advocacy campaigns. As you may be starting to suspect, I think there are some parallels. Advocacy campaigns are often big, complex, multi-year endeavors. They have a clear goal, but the process can be very messy and filled with unexpected twists and turns. Successful advocacy campaigns will involve people with many different forms of expertise: strategists, lobbyists, field organizers, communications, technology, policy experts, attorneys, fundraisers. Each of these disciplines sees the world very differently, and advocates for different values. So far, lots of parallels to that big building project, right? But when I look around at the leadership circle of most of the advocacy campaigns I’ve been familiar with over the years, I don’t see that diversity of disciplines represented. Mainly I tend to see lobbyists and/or policy experts. Strategy, field organizing, communications, technology, or development are rarely represented at the leadership table, and if they are, they’re typically represented by junior staff who are lack status and power with respect to more senior lobbyists/policy experts. Over time, this results in unbalanced campaigns, where critical expertise from all of the relevant disciplines is dominated by one or two limited perspectives. Such campaigns may experience short-run success, but they quickly run into the limitations of their narrow leadership perspective. Worse, I see a disturbing pattern wherein certain of these disciplines (e.g. communications, field organizing) are long-term under-resourced, which results in these disciplines never developing senior staff-level expertise, which makes it all the harder for these disciplines to credibly represent themselves and be taken seriously at the leadership table. This further deepens the vicious cycle of unbalancing. Have you been a part of an “unbalanced” campaign? What was it like? How do we create more balanced campaigns? Does Earth Hour have any kind of strategic purpose? If anyone can explain to me the theory of change behind Earth Hour, or how it actually builds power for the climate change movement, I’d love to hear it. Posted on 3/27/2010 Author Jon StahlTags environment, strategy1 Comment on Does Earth Hour have any kind of strategic purpose? Copenhagen was doomed to failure from the day that Obama decided to do health care in 2009 and not climate legislation. Enviros should have recognized this and responded by de-emphasizing the strategic importance of Copenhagen, and focusing their limited resources to prepare for 2010. Back in November, Alex Steffen of Worldchanging.com delivered a bravado two-night set of talks at Seattle Town Hall, exploring a hopeful vision for a prosperous, sustainable future and the opportunity that cities like Sattle have to lead this transformation. They’re now available online, and I certainly plan to load them up on my iPod ASAP. 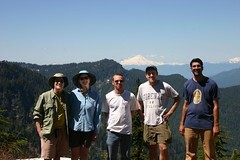 Washington state’s Environmental Priorities Coalition has released their 2010 Environment Priorities. These are the key issues that the entire Washington state environmental movement are going to drive forward via team offense. Safe Baby Bottle Act This act would phase out BPA in baby bottles, food and beverage cans, and other consumer products. Read more. Sustain Environmental Protections in the Budget We aim to ensure Washington’s budget sustains core environmental protections that safeguard the health of our families, communities and economy. Working for Clean Water The Working for Clean Water bill is about creating jobs, rebuilding local economies, and cleaning up polluted waterways. It’s a good list, focusing on the fundamentals at the intersection of the economy, health and the environment. I’m looking forward to being a (small) part of the process. Paul Krugman has a great column on climate change today. This leapt out at me. Wow, he just drew a parallel between climate change and nuclear war. And you know what, he’s right. Both are fundamental, existential threats. I’m so happy to have an administration that understands this and will act accordingly. Washington State E-Waste Recycling Starts! Starting tomorrow, January 1, 2009, Washington state residents will be able to recycle computers, monitors and TVs at no cost, thanks to the e-waste producer responsibility laws we passed in 2006. You can find collection sites here, or read more about the program here. This is a big step forward for responsible recycling in Washington! Congrats to the WalkScore team for being featured in today’s Sunday New York Times! restaurants, gyms, schools and more â€” all for free. The site works for any address within the United States, Canada, and even Britain. We launched our biggest Plone-powered website ever last night: High Country News. We’re still recovering from the final push, but we’ll offer a detailed technical writeup soon. Reading about the floods on the Mississippi makes me think of John McPhee’s masterful 1989 book “The Control of Nature” in which he talks about New Orleans’ three hundred year battle against the Mississippi. In this age of hurricanes and floods, McPhee’s work is still visionary and clear-sighted. I can’t recommend it highly enough. Wonder no more: we got back from the Lake District a week ago. We spent 10 days hiking around the fells and dales and staying in hostels. A couple of days in London the way out. It was great. England is very pretty and frighteningly expensive. The photos are here. The food was generally pretty mediocre, although not as bad as one might fear. Kudos to Martin & Esuk for taking us out for some really good Indian food in London — the cheapest and best meal of the trip, without doubt. Two other exceptions: I had some fantastic lamb at in Elterwater (surprisingly easy to enjoy, even after a day of wandering amongst the sheep) and I’m not sure we had a potato during the entire trip that was less than tasty. The British take their potatoes seriously. Britian has a lot of nice typography on their signage. Count me among the fans of Transport and Johnston. On a related note, this in-depth article from last week’s NYTimes Magazine about a new font for U.S. road signs is worth a read. Brits drive on the left. Curiously, though, they walk on the right. Go figure. I’m really sorry, but British beer doesn’t hold a candle to Northwest microbrews. It’s not the concept of room-temperature ale (twisted though it may be) — it’s just that the average beer I had just wasn’t that good. Bluebird Bitter, a local microbrew from Coniston, was the lone standout. We may not be Belgium yet, but we’ve got nothing to be ashamed of. For seven years, Mr. Mackey had an online alter ego. Using the pseudonym Rahodeb â€” a variation of Deborah, his wifeâ€™s name â€” Mr. Mackey typed out more than 1,100 entries on Yahoo Financeâ€™s bulletin board over a seven-year period, championing his companyâ€™s stock and occasionally blasting a rival, Wild Oats Markets. Sigh. A sad commentary on the state of our culture. Ben, Anil, Anil’s colleage Dan, Molly and I celebrated the 4th today with a great hike up Perry Creek to Mount Forgotten Meadows. As always, I’m proud to live in a country that has such great protected public lands. May they always remain wild and free for everyone to enjoy. costume and spent a lot of time commuting and traveling and documenting the travails of a man in tights dedicated to reducing personal automobile use. Alex Steffen muses about innovation and green philanthropy in a network age. Worth a read — his big questions resonate strongly with our experiences here at ONE/Northwest. WWF Canada have commissioned this very clever billboard, which casts a shadow on itself that creates a shadow-animation of rising waves, to dramatize the reality of climate change. Or does WiserEarth, Paul Hawken’s new web 2.0 community mega-wiki-directory project, seem an awful lot like a reimplementation of Idealist.org?